Location in Lincoln County and the state of Maine. 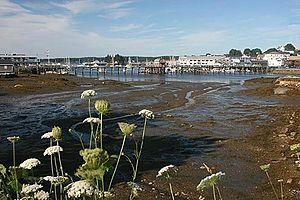 Boothbay Harbor is a town in the county of Lincoln, state of Maine, in the United States. The population was 2,165 at the 2010 census. During summer months, the entire Boothbay Harbor region is a popular yachting and tourist destination. ZIP Code is 04538. The community is served by the 633 exchange in Area Code 207. The area was part of Cape Newagen, where the English established an early seasonal fishing camp. In 1666, Henry Curtis purchased the land from the sachem Mowhotiwormet, commonly known as Chief Robinhood, who lived at what is today Woolwich. But the settlement was attacked and burned during King Philip's War, resettled shortly afterwards, then destroyed again in 1689 during King William's War. It was abandoned for 40 years. In 1730, Colonel David Dunbar, the superintendent and governor of the Territory of Sagadahock, laid out a new town, named Townsend after Viscount Townshend. Despite predations during the French and Indian Wars, and robberies during the Revolutionary War by marauding British sailors, the settlement was successful, not least because of its large, deep and protected harbor. During the Penobscot Expedition, in 1779 Townsend became a rendezvous point for the American naval fleet prior to its disastrous encounter with the British at Castine. 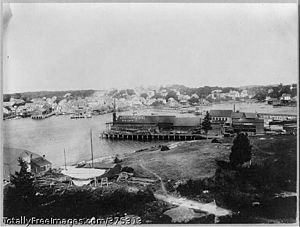 Renamed Boothbay in 1842, the harbor continued to develop as a fishing center. In bad weather, it could hold at a time between 400 and 500 vessels, often Friendship Sloops, seeking shelter. By 1881, it had a fishery and fish oil company, an ice company, two marine railways, a fertilizer manufacturer, and a factory for canning lobsters. On February 16, 1889, the community was set off from Boothbay and incorporated as the town of Boothbay Harbor. Frank L. Sample shipyard at Boothbay Harbor built minesweepers for the United States Navy during World War II and into the 1950s. Some location filming for the 1956 movie version of Rodgers and Hammerstein's Carousel, notably the "June Is Bustin' Out All Over" sequence, was done there. Each summer, Boothbay Harbor draws crowds of tourists. Attractions include the state aquarium, art galleries, restaurants, boat tours to coastal islands and whale watching. According to the United States Census Bureau, the town has a total area of 9.22 square miles (23.88 km2), of which, 5.70 square miles (14.76 km2) of it is land and 3.52 square miles (9.12 km2) is water. Boothbay Harbor is located on a peninsula in the Gulf of Maine, part of the Atlantic Ocean. The town is crossed by state routes 27 and 96. 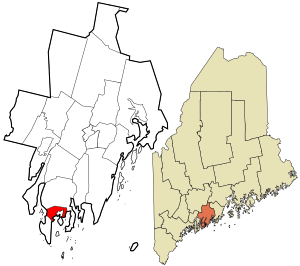 It borders the towns of Southport to the southwest, and Boothbay to the north and east. As of the census of 2010, there were 2,165 people, 1,084 households, and 550 families residing in the town. The population density was 379.8 inhabitants per square mile (146.6/km2). There were 2,175 housing units at an average density of 381.6 per square mile (147.3/km2). The racial makeup of the town was 97.1% White, 0.6% African American or Black, 0.3% Native American, 0.8% Asian, 0.1% from other races, and 1.2% from two or more races. Latino of any race were 0.7% of the population. There were 1,084 households of which 14.9% had children under the age of 18 living with them, 40.9% were married couples living together, 7.3% had a female householder with no husband present, 2.6% had a male householder with no wife present, and 49.3% were non-families. 41.8% of all households were made up of individuals and 22.6% had someone living alone who was 65 years of age or older. The average household size was 1.90 and the average family size was 2.52. The median age in the town was 55.8 years. 11.6% of residents were under the age of 18; 5.4% were between the ages of 18 and 24; 16.6% were from 25 to 44; 33.3% were from 45 to 64; and 33.2% were 65 years of age or older. The gender makeup of the town was 45.5% male and 54.5% female. As of the census of 2000, there were 2,334 people, 1,097 households, and 627 families residing in the town. The population density was 404.3 people per square mile (156.2/km²). There were 1,993 housing units at an average density of 345.2 per square mile (133.4/km²). The racial makeup of the town was 97.9% White, 0.2% Black or African American, 0.30% Native American, 0.73% Asian, 0.34% from other races, and 0.56% from two or more races. Hispanic or Latino of any race were 0.90% of the population. There were 1,097 households out of which 21.9% had children under the age of 18 living with them, 46.4% were married couples living together, 8.4% had a female householder with no husband present, and 42.8% were non-families. 36.6% of all households were made up of individuals and 18.4% had someone living alone who was 65 years of age or older. The average household size was 2.05 and the average family size was 2.67. In the town, the population was spread out with 17.4% under the age of 18, 5.4% from 18 to 24, 22.9% from 25 to 44, 28.3% from 45 to 64, and 26.0% who were 65 years of age or older. The median age was 48 years. For every 100 females there were 84.2 males. For every 100 females age 18 and over, there were 81.9 males. The median income for a household in the town was $35,000, and the median income for a family was $45,000. Males had a median income of $30,000 versus $21,000 for females. The per capita income for the town was $21,146. About 5.9% of families and 10.7% of the population were below the poverty line, including 16.7% of those under age 18 and 8.7% of those age 65 or over. Boothbay Harbor, Maine Facts for Kids. Kiddle Encyclopedia.